Saturday June 30th is the last day to become a Barefoot Books Ambassador and get the Starter Kit for the incredibly low price of $89.99. I have had two amazing women join my team during the Starter Kit special offer...would you like to be the third? 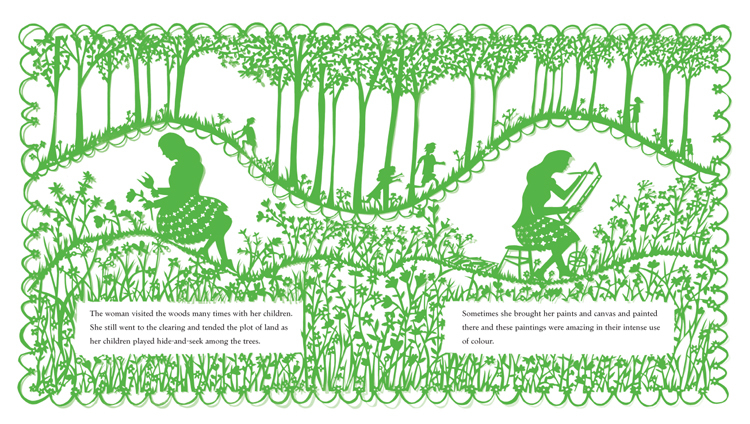 Saturday is also the end of the current sale at the Barefoot Books website. Check out all the great books at great prices, and remember that you can save an additional 20% when you use the code TWENTY12 in the Special Offer/Voucher Code box when you check out. Finally, a great big THANK YOU to all the generous book-lovers who ordered Barefoot Books this month to support my Tesfa Foundation fundraiser to build schools in Ethiopia! As of right now, my donation to Tesfa for June will be $90 - but if you place an order before Saturday, I would be happy to make a $100 donation instead (or more)! The fundraiser will continue into July and August, but wouldn't it be great to start strong in the first month? 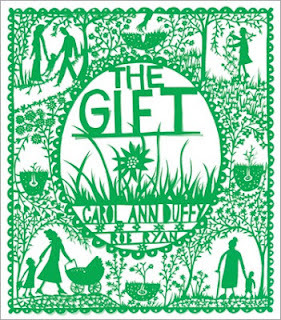 The Gift: The exceptional talents of Carol Ann Duffy and papercut artist Rob Ryan combine to present the story of a girl’s journey through life and the desires that shape it. 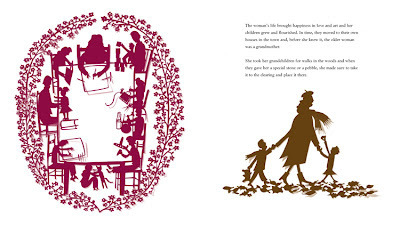 With a kind of magic that is timeless, The Gift speaks to everyone who wonders about the mysteries that lie at the heart of the human experience. I have had this book on my wish list for quite a while now, and finally ordered it earlier this month. 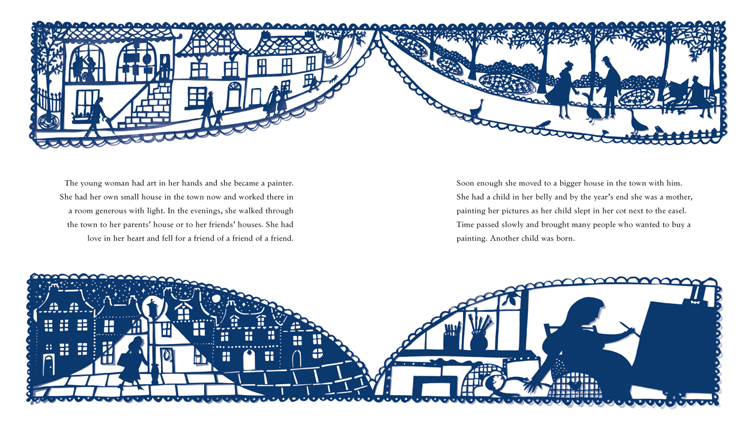 So many people have told me how beautiful this book is, and they were so, so, SO right. 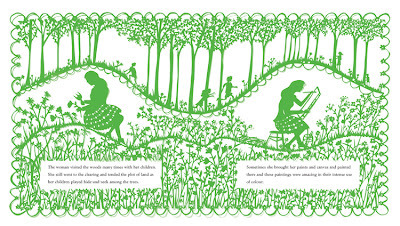 It's hard to believe, but each gorgeous and intricate illustration was handcut from a single sheet of paper by Rob Ryan, then individually colored by spray paint and photographed. Each page is a different color, and every single one of them is a work of art that I would gladly hang on my walls. Bees prayed for honey at a wild rose bush. A thought suddenly came to the girl - as urgent and vivid as a butterfly opening its orange wings - that she wanted to be buried in this plot of land when she died. 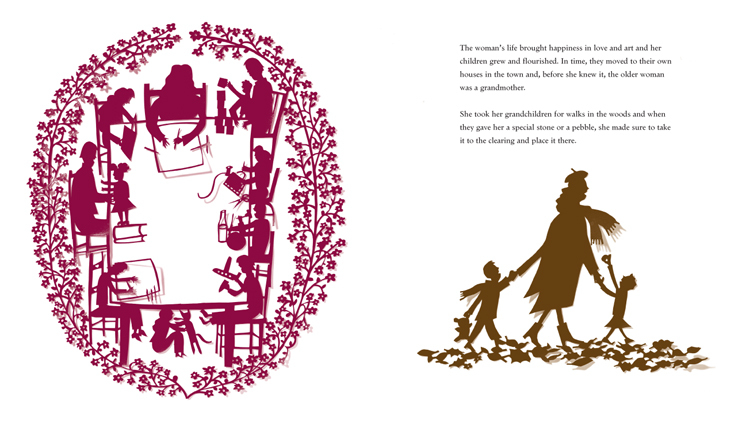 I realize that sounds a bit morbid for a children's book, but I promise you everything turns out beautifully in the end! Like many children adopted from Ethiopia, my daughter Elfe has already experienced the death of someone close to her at a very young age. She is also extremely curious and inquisitive, as well as highly verbal - which is another way of saying she asks a lot of questions! As a long-time agnostic, I have struggled mightily to answer her questions about what happens after death in a way that feels "true" to me but also gives her some comfort and a sense of security. 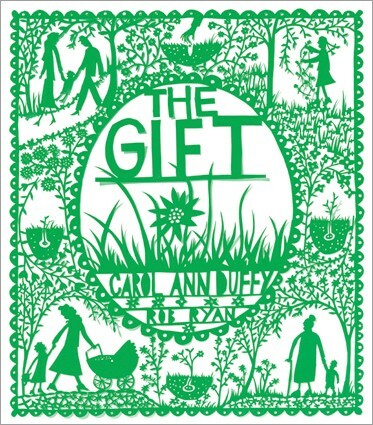 The Gift is a book that accomplishes exactly that in my opinion. The Gift is intended for children ages 8 and up, but my somewhat precocious and extremely intuitive book-loving almost-five-year old was able to follow along. The language of the book is simple yet full of gorgeous imagery, so even children younger than 8 can get something from it. We will be reading this book for a long time to come, and I think we will both draw comfort from it. Still thinking about joining my team? If you are still thinking about joining my team as a Barefoot Books Ambassador, this is just a gentle reminder that the clock is ticking on the amazing Ambassador Starter Kit discount. The Starter Kit will be available for the unbelievable price of just $89.99 through the end of June, and then it will go back to the regular price of $139.99. Of course, I would still be thrilled to have you join my team after June, and the Starter Kit is still a great value at the regular price. But why pay more than you have to, right? Or maybe you are the type of person who wants a lot of details before you commit to something...if so, I have the perfect opportunity for you! Every Tuesday evening at 8PM Eastern Standard Time, Marsha Mitchell - the North American Director of Ambassador Sales for Barefoot Books - will lead a conference call for anyone considering the opportunity to become a Barefoot Books Ambassador. The calls will last between a half hour and 45 minutes; Marsha will go over all the details of the Ambassador compensation plan and answer any questions you might have. I have worked with Marsha and she is a fantastic resource - she can help you figure out how to be successful as an Ambassador right from the beginning. I encourage anyone thinking about joining my team to get on one of these conference calls and really pick Marsha's brains about this opportunity! Please let me know in advance if you want to be on one of these calls so I can plan to be on the call with you; I can also check in with you after the call to answer any other questions you might have. Thanks for considering this opportunity, and I look forward to talking with you soon! It should come as no surprise to learn that my daughter Elfe is a true book-lover. She's an extremely active little girl - running, jumping, dancing, riding her bike, swinging on the play structure at school - but she also loves to curl up on the couch with me and read book after book after book. At not quite five years old, she can't read books herself yet, but that doesn't stop her from sitting down with a pile of books and paging through them, or wanting to have books in bed with her at night to help her fall asleep - or "reading" them to her dolls! 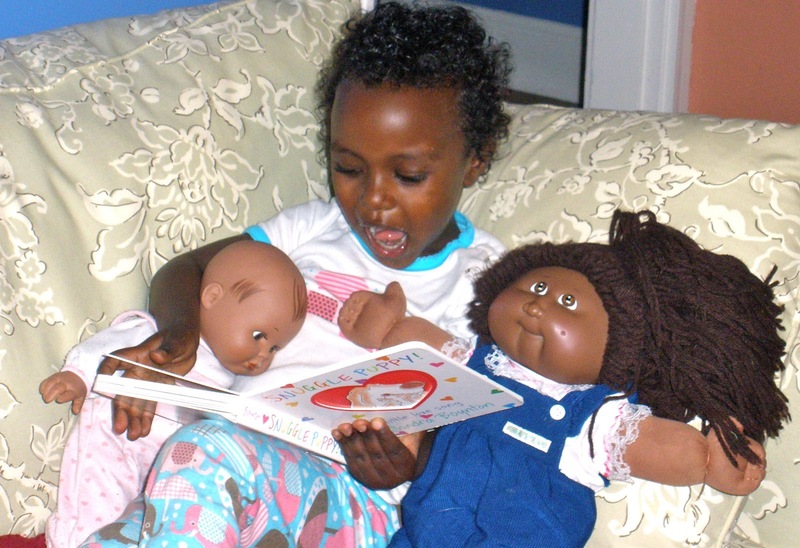 Here she is about two years ago "reading" to Baby Judy and Gacko, her favorite dolls. What you may not know is that she has been this way from the very first moment I met her in Ethiopia in December of 2009. Right after we met for the first time, she went through my bag and pulled out the pocket Amharic-English dictionary I had with me; she held onto that little book the entire week we spent together in Ethiopia, and it still holds special meaning for both of us. What I find most amazing about her love of books is that she more than likely never even saw a book before she was over two years old. Elfe is from a rural area of Ethiopia, where schools and libraries are few and far between. I was not able to visit her family's home in Ethiopia when I was there, but from what I know about what is typical in that area, I doubt they had any books in the house at all. Where does her love of books come from? And what would she have done with it if she had stayed in Ethiopia? I do not like to use the word "lucky" in the context of adoption, but in this case I can't help feeling lucky that I am able to provide Elfe with access to the books she so obviously loves and craves. 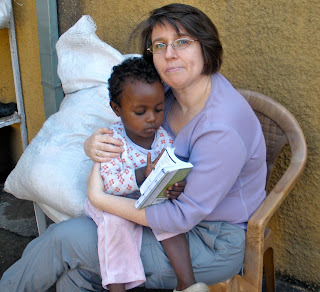 Would you like to help me make sure that parents in Ethiopia are able to feel similarly lucky that their children have access to an education so they can nurture and sustain their own love of books? I am very pleased to announce today that I will be supporting the Tesfa Foundation's newest initiative in Ethiopia - their 5x3 project to build five new schools in the next three years. And you can help me! I will donate 20% of what you spend (excluding tax and shipping) to support School #3 and School #4 of the Tesfa 5x3 initiative. Funds will be split 50/50 between the two schools. Please make sure that you shop by clicking the link to my marketplace so that I know you are purchasing in support of Tesfa - and feel free to send me an email (liz@ReadingBarefootinBoston.com) to let me know about your purchase if you want to be extra sure I include it in the fundraiser. This fundraiser will run for the months of June, July, and August. As our kids here in the US are getting out of school, enjoying their summer vacation, and getting ready to go back to school in September, we can be doing our part to help make sure kids in Ethiopia get the education they deserve. Tesfa means "hope" in Amharic. I hope you will join me in building schools in Ethiopia.